I just got back from my weekend blogkada staycation for Make It Makati at the Holiday Inn. It was a riot, super fun. I still have a hangover from it and a bit of seapration anxiety. We hardly slept and I'm still a bit tired from it. Started my day with a green smoothie to help boost my recharge. Speaking of juicing and blending, would you want me to share my recipes, tips and how to's? About the outfit, this is my second twin ootd with Ana. This is what we wore to the Rexona Run To Your Beat event (hence the sporty theme), Veloci Watches, Yabu SM North opening, and a bloggers united thing in SM MOA. Yes it was another one of those "national events days". Shuttling back and forth is so tiring especially with our traffic situation which is why I am so glad I decided to go with the most comfortable shoes I own. 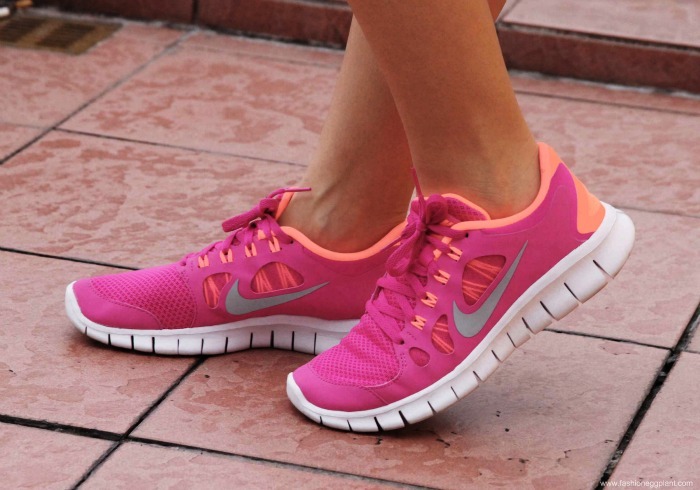 My Nike Free Runs. I initially bought my Free Runs for working out but I love them so much that i have also been wearing them around a lot. Ah super cool post! From the snapback, to the Pink Floyd shirt, then origami shorts, going to Nike kicks! awesome!